Augustus J. Bump was born in Meadville, PA in 1818. 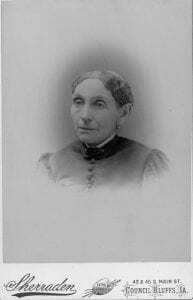 Mary F. Milliken was born in 1823 in Kennebunkport, ME. A. J. and Mary were married in Ohio in 1842 and eventually had two children, Charles and Mary. The family arrived in Council Bluffs in 1852. 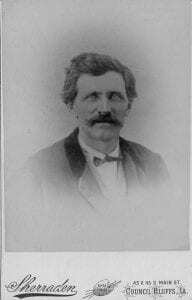 Augustus took up farming until 1863 when he was elected city marshal. In 1869 he was appointed chief of police, a position he held till 1872. At that time he once again took up farming. Mr. Bump had a nine acre fruit orchard on his farm and in 1879 he grew a corn stalk that was 14 feet 4 1/2 inches tall. A.J. and Mary were spiritualists and were involved with the local spiritualist society. Spiritualists believe that the spirits of the dead exist and have the ability to communicate with the living. Mary Bump was known as a “healing medium”. In 1887 A.J. Bump’s health started to fail and after a lengthy illness he passed away July 22, 1888. Mary Bump died February 10, 1894. Both A.J. and Mary are buried in Fairview Cemetery.